Why am I choosing Zayne right now? I can't say this means I'll definitely be Zayne's team by the end of this book, but seriously, y'all...Zayne is so swoon-worthy. He shook his head as he walked--no, stalked--toward me, each step full of purpose and with an inherent grace a dancer would be envious of. "You're beautiful," he said, yes a brilliant, luminous shade of blue. "I don't think I've ever told you that." "You haven't, but I'm n--"
"Don't say you're not." His gaze dipped once more to where Bambi's head rested, and air leaked out between parted lips. For once, the demonic familiar didn't move. "Because you are, Layla. You're beautiful." He moved one hand down the back of my head, guiding my face to his chest, and wrapped his other around the hand attached to my injurded arm. "I can feel your heart pounding," he said, his voice muffled by my hair. "Try to take a couple of deep breaths." "I know you cared about him," Zayne said, threading his fingers through mine. "But don't forget about me. I'm here for you. I always will be." My breath caught around a sob. He lowered his head and after a second, his lips brushed my cheek. Only Zayne, who knew what I could do to anyone with a soul, would dare to get that close. "Okay?" And that's only the beginning. (Literally. I didn't go too far into the book to find those quotes.) Zayne's so sweet and lovable and I can't wait for everyone to SEE how great he is. He totally deserves the title of book boyfriend. Without any doubt at all. I HEART HIM, GUYS. CAN YOU TELL? Val also made a pretty Zayne cuddly teaser. Here that is because I LOVE IT! So what do you think? 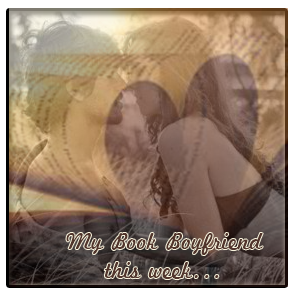 Do you have a book boyfriend to share? Leave us a comment! Great pick this week! Can't wait to get to know Zayne. Zayne? Really? After the first book, I am team Roth- maybe I will switch on Tuesday.